CORE 6 Person Instant Cabin Tent with Awning is a pleasant freestanding tent for summer camping with an incredibly easy and fast setup and a great price tag. CORE 6 Person Instant Cabin Tent with Awning. You see a lot already from the name of this tent. So obviously this is an instant setup design, they claim it can be pitched in 60 seconds and I would take this literally. The poles are preattached in the factory and they are telescopic. So you simply open the tent and then extend the poles one by one and it is ready. Well, almost ready, there is the fly to put above but even this is an easy job because of its minimal size. One person can do the job but it is easier if there are two people doing this together. The tent is a cabin type as the name says, so the walls are straightened and tall, with a big angle, and you have large windows around. 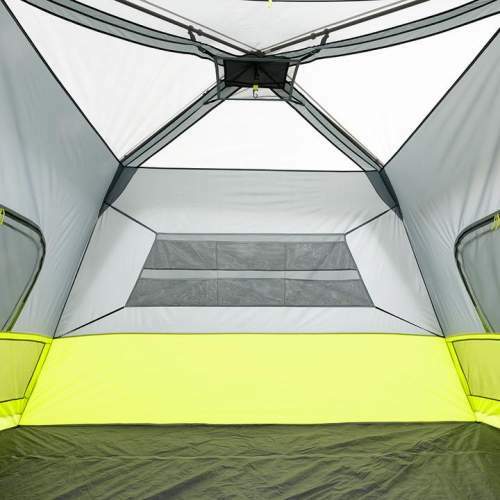 The fly is built to allow for nice views so it does not cover the whole tent and you have views around. It creates a small awning above the door, this is nice to have to avoid the rain getting in. 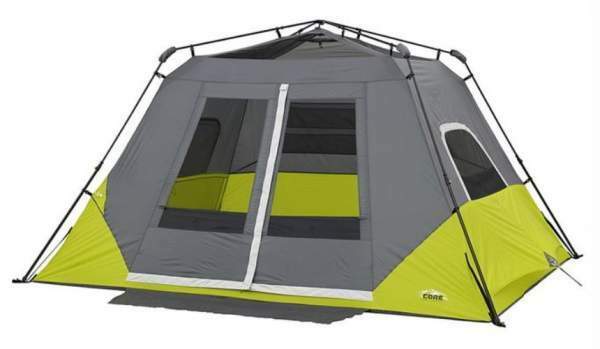 This awning appears to be the main difference between this tent and the other 6-person tent from the same brand. The Core 6 tent shown without the fly. The frame is preattached to the tent. 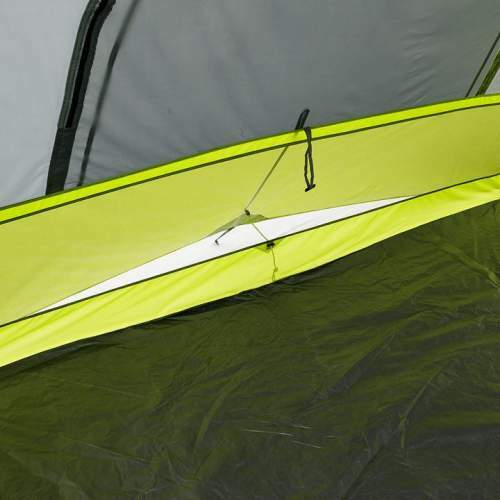 With all mentioned features, the tent is fully freestanding and this holds even when you add the fly because it attaches to the four corners. In other words, even after you put the fly on, you can move the tent around, rotate to have the best orientation and views. So this is a pleasant and users friendly structure. The tent is only moderately tall for a cabin tent, 72 inches (183 cm), and if this is a big issue, rather check my list with very tall camping tents, all above 215 cm. Space-wise, you have 99 ft² (9.2 m²), and this means 16.5 ft² (1.53 m²) per person if used by 6 people as its official capacity suggests. It is possible to squeeze 6 sleeping pads on the floor so the tent can indeed accommodate such a number of users, but this is unrealistic for real camping. Note that you have no storage areas like vestibules or a porch. So although the tent can accommodate two queen size beds, realistically, this is a tool for a couple or for parents with one kid maximum. You can save the space by using bunk cots, they fit nicely with such walls, and you will still have space underneath such a cot to store the gear. This tent is very suitable for couples. Seasons-wise, this is a tent for summer camping and no more than that. The ceiling is all mesh and you also have floor vents and mesh on the windows and the door. These all features are great for warm weather camping in a quiet area without strong winds. But such a structure does not keep the warmth, so if you need something for a cooler environment, better check this list with fully enclosed tents. Climate-wise, I already pointed this above, this is a tool for an area without much rain and without strong winds. In the case of lots of sand and dust in the area, rather choose one of those tents mentioned in the line above, with PVC windows and without mesh. You would be cold in this tent if you use it in a cooler climate, it is simply too open with such a ceiling. The weight and the packed size are such that you definitely need a car for such a tent. It is heavy, 24.5 lb (11.1 kg), and also very bulky 48 x 8.25 x 8.25 in (122 x 21 x 21 cm). But this is quite justified because of the materials (steel) and the construction (instant setup). So all in all, this tent is perfect if you are on a cross-country motorized tour and you change the place frequently, you will have this tent ready in a minute or two and you can pitch it anywhere. This is the tent packed. The poles are made of steel and they create a frame which is preattached to the tent and this is what makes the setup so quick. They write about 30 seconds setup in their site. There is yet another separate pole which is added above the door to create the awning. The walls are a reasonably durable 68D polyester. They do not give any waterproof rating and this is disappointing. So I would not expect much. They only write about the H2O Block Technology that combines the water repellent fabrics with a PU coating and with active bead technology and with sealed seams and rain-resistant door/window seals. The same is with the fully-taped rain fly, no info. The ceiling is all mesh. The floor is a polyethylene so this is a plastic and at least from this side you should be safe, it is waterproof. Note that the materials are not fireproof, so do not cook inside and avoid open flame in general. There is only one door, but it is large and with an inverted T-shaped zipper. There are two side windows. All the openings are double layer structures with a mesh and panels. So you have views on three sides and this makes the tent so pleasant. This is a good feature of the tent. You have lots of mesh, the complete ceiling is a high vent if you wish to describe it that way. But you also have the floor vent shown below, and this will be good enough when it is raining and the windows and the door are closed, otherwise keep them with mesh only for extra air circulation. 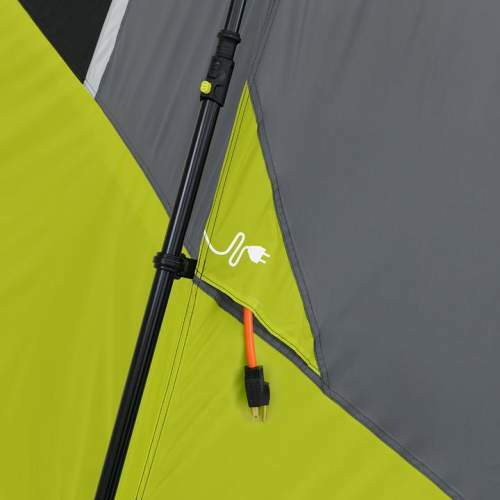 The tent is with a zippered cable port shown above. You have a lantern ring on the apex, plus a gear loft shown in the picture above. The back wall is designed without windows so here you hang the large organizer with numerous pockets which you can use as your media center. It is shown above. Type: freestanding instant cabin tent. Weight: 24.5 lb (11.1 kg). Dimensions: 11 x 9 ft (335 x 274 cm). Area: 99 ft² (9.2 m²). Packed size: 48 x 8.25 x 8.25 in (122 x 21 x 21 cm). Setup time: 30 – 60 seconds. In the table below, I give this Core 6 tent side by side with two other built in the same style. This might help to understand its features better and to get some idea what other models may offer. Please follow the links to check for the price updates. 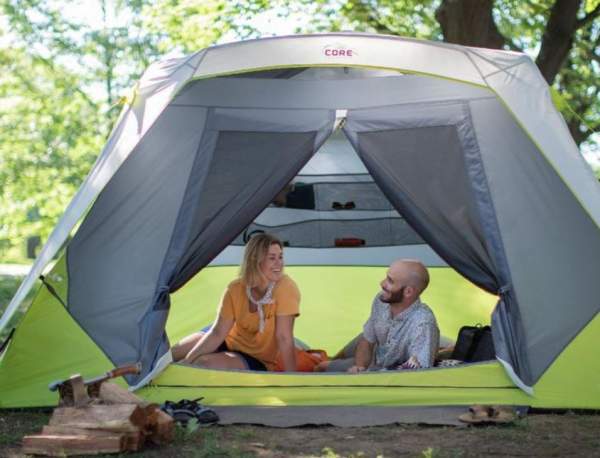 The CORE 6 Person Instant Cabin Tent with Awning is a new item on the market, but the only really new feature here is the fly design with an extra pole that creates a front awning. This is a very pleasant structure for summer camping, but it is far too small for the declared capacity, so downgrade the number of users by half and you will have a great camping tent. Because of its easy setup, I have included it in my list of instant camping tents. This particular size group, the 6-people tents, is very diverse regarding the physical size and type of the tents, so check in the category 5 & 6 person tents if you need some more options to check. You will find true giants in this group, but you will also find backpacking 6-person tents as well. If you need more options for cabin tents just check here. But if you need a canvas 6-person tent, check this Teton Sports Mesa 14 Canvas Tent. You might want to also check this cabin-type 5-person Skandika Weatherproof Tonsberg Tent which offers far more space in its 3 rooms. Thank you for reading. What do you think about this tent? Any experience with it? If so please share it here, this can be useful for other people, there is a comment box below. I wish you a nice day.